Mario + Rabbids Kingdom Battle Trailer and Gameplay Details | Nerd Much? 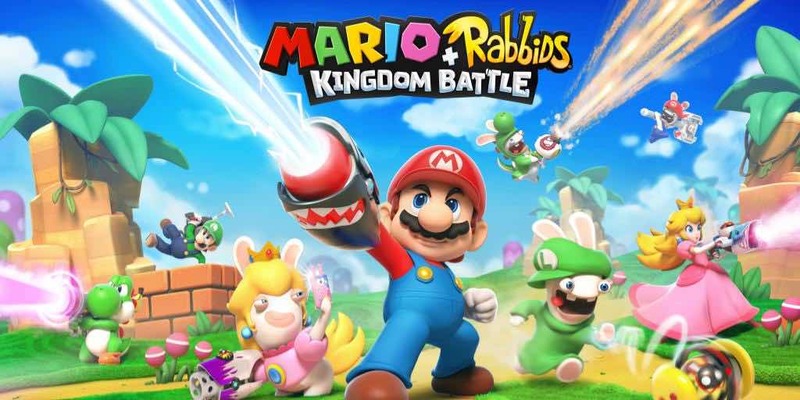 Ubisoft and Nintendo have officially unveiled their new game Mario + Rabbids Kingdom Battle. The game features characters from the Mario world like Luigi, Princess Peach, Yoshi, and four Rabbids heroes: Rabbid Mario, Rabbid Luigi, Rabbid Peach, and Rabbid Yoshi. This unlikely partnership is a result of Rabbids finding themselves in Mario’s world. The mission of the game is to find out why and to restore the Mushroom Kingdom with each other’s help. Torn apart by a vortex of unknown origin, Mario and the Rabbids must work to investigate the cause. The gameplay is essentially like XCOM; turn-based combat and top-down strategy. The battlefield is moved through slowly using the pipe system, jump boosts from friends, destroying cover, and following the blue line. In local multiplayer, friends take control of the other characters and plan their own strategy through each puzzle and combat situation in three different levels of difficulty. Mario + Rabbids Kingdom Battle will be available August 29, 2017 exclusively on the Nintendo Switch. Come the release date, the game will have Standard and Collector’s editions. The standard edition is only the game, whereas the Collector’s includes the game, a six-inch figurine of Rabbid Mario by Ubicollectibles, a set of physical collectors cards, and the original soundtrack on CD. You can pre-order the game and receive a set of eight in-game exclusive weapons with unique stats, and four exclusive figurines inspired by The Rabbids Heroes.